A world-renowned Indian dish, biryani takes time and practice to make but is worth every bit of the effort. Long-grained rice (like basmati) flavored with exotic spices, such as saffron, is layered with lamb, chicken, fish, or vegetables, and a thick gravy. The dish is then covered, its lid secured with dough, and then the biryani is cooked over a low flame. This is definitely a special occasion dish. There is much debate of how this dish came to be, but most agree that its origins began in Persia as a rustic rice and meat dish and then traveled to India. The various recipes of biryani were then born, mainly where there was culinary influence from Muslim foods, particularly in the city of Hyderabad, in south India, but also along the southern coast. 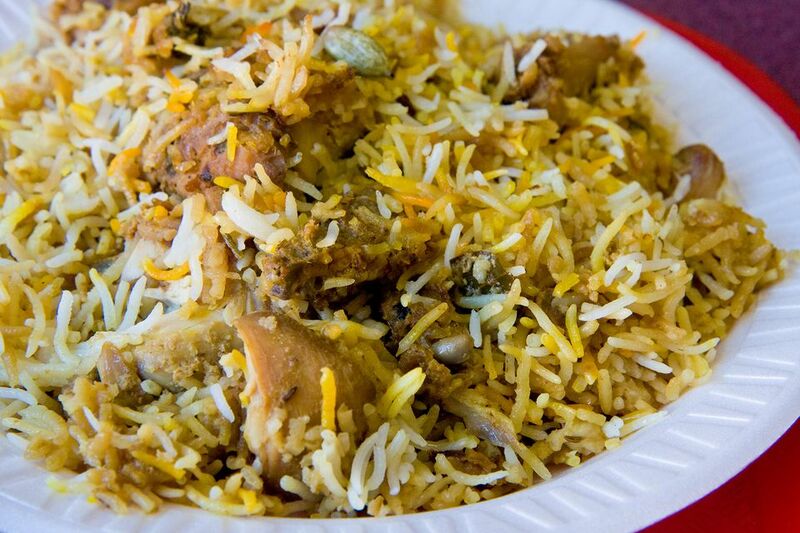 Biryani's many, many variations depend on where the dish is based. Some differences are subtle while others are distinguished by added or substituted ingredients. The main components of this dish are rice, meat, marinade, and spices. Basmati rice is definitely prevalent, but you will also find other grains such as seeraga samba and jeerakasala. Depending on where the biryani is from will determine the type of protein; coastal regions, for example, will include fish and shrimp, while inland areas may incorporate chicken, goat, mutton, and beef (mainly buffalo, but if cow, would be outside of India). The meat is usually marinated before being cooked, and the most common marinade is yogurt-spiced based as the acid in the yogurt helps to tenderize the meat. It is the layers of spices that give a biryani its complex flavor, and these spices can be whole or ground, or individual or a spice mix (such as garam masala). Herbs and seeds may also be a part of the dish, which is often topped with caramelized onion, dried or fresh fruit, nuts, and fresh herbs. There are several main types of biryani that are specific to certain communities. Each variety is named after the place it was created. Sindhi biryani: This exotic and aromatic type of biryani is popular in Pakistan and known for its spicy taste, fragrant rice, and delicate meat. It is made with meat and Basmati rice, vegetables, and various types of spices. Hyderabadi biryani: This biryani is one of India's most popular types of biryani. It incorporates goat meat that is marinated and cooked along with the rice and is seasoned with coconut and saffron. Malabar Biriyani: This is the only version of Biryani in Kerala, an Indian state. It is a popular dish eaten by the Malabar Muslim community and incorporates Khyma rice mixed with ghee. Calcutta/Kolkata biryani: This biryani mostly uses potatoes and eggs and only sometimes contains meat. It is much lighter spice wise; the marinade is made of cinnamon, nutmeg, cloves, cardamom, and other spices, and the rice is flavored with ketaki or rose water and is yellow in color. Ambur biryani: This leather-tanning city in Tamil Nadu makes one of the most famous types of biryani, and the town has more biryani shops than any other city in the world. The meat and rice are cooked separately and then brought together, along with mint leaves and curd. Lucknowi biryani: This type of biryani is based on a Persian cooking style so it uses the dum pukht method where the meat and gravy are only cooked partially and are then layered and served in a sealed handi. The spice profile is not as intense. Mughlai biryani: This biryani is cooked with curd, chicken, almond paste, ghee, dry fruits, and green chilies, and has a rich flavor. Kalyani biryani: Small chunks of buffalo meat go into this form of biryani, which is known as the "poor man's Hyderabadi biryani." It is rich and flavorful but does not include more expensive ingredients.